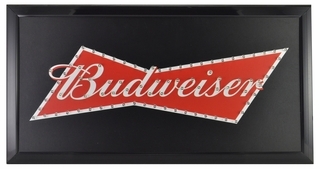 If you love great American beer, then you have to own this beautiful licensed classic Anheuser Busch Budweiser LED wall sign. Equipped with high intesity red and white LEDs this sign looks fantastic lit or unlit and is a perfect party room wall decoration. The Budweiser sign is all black with the Budweiser bow-tie brand logo in the center. When you flick the switch the Logo comes to life with the white LEDs in the Budweiser glowing bright and the red LEDs around the edge of the bow-tie blinking on and off chasing clockwise. Measuring 19 inches by 10 inches this groovy sign comes ready to hang and use immediately. This Bud(sign)'s for you!! !